When kept as a talisman, a horseshoe is said to bring good fortune. We believe that the horseshoe should be hung with the ends pointing down, as it will then release its luck to the people around it. 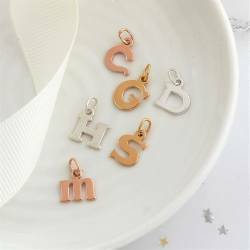 These necklaces make thoughtful gifts for someone taking exams or a driving test, or maybe they need an extra special bit of good fortune. A faceted natural crystal quartz heart or square hangs from a delicate sterling silver curb chain. 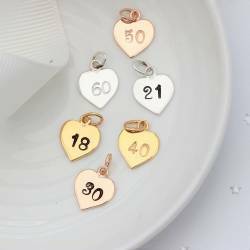 The heart and square are softly rounded so are not completely flat. The faceting makes them gently sparkle as they catch the light. 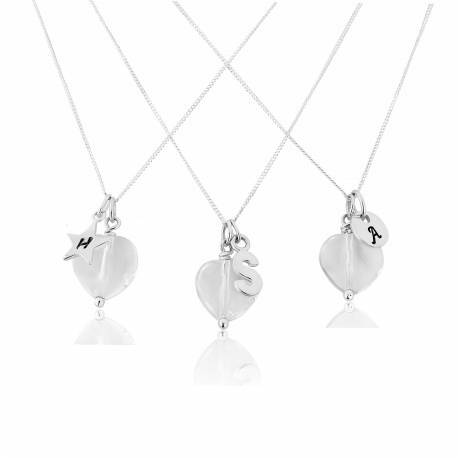 The charms can be easily removed from the necklace so the faceted heart or square can be worn by itself. Once we’ve created the perfect necklace for you, we’ll carefully package it in one of our beautiful black gift boxes with a gift card. We’ll then finish it with a flourish of ivory ribbon ready for you to give to the lucky lady. Sterling silver and natural crystal quartz. The chain has a silver extension chain so the shortest length is 16"/ 40cm but it extends upto 18"/ 45cm. There is also a 14"/35cm length chain for children. The crystal heart and square are approx 11mm by 11mm wide. They hang approx 20mm from a sterling silver link chain. Childrens items of jewellery should not be worn overnight or for periods exceeding 24 hours and should be supervised due to small parts.